Mongolian Copper Corporation has ended the year of 2017 with many achievements, such as “The Best Deal of the Year” from “Bloomberg TV Mongolia Awards, and “The Best Corporate Governance Implementing Entrepreneur” by MNCCI. Following such honorary awards, on December 21, 2017 CEO of MCC, Mr.Purevtuvshin has received the top prize, “Silver Lion-2017 Award” from “Council of Khovd Province” for his achievements in finance and business sector of Mongolia, representing the other young professionals. During the event, “The Night of Khangai 10”, Chairman of BOD of MCC, Mr.Munkhbaatar was awarded as “Young Generation-Best Supporter of the Year” for his leadership, dedication and contribution to prosperity of the young generations. 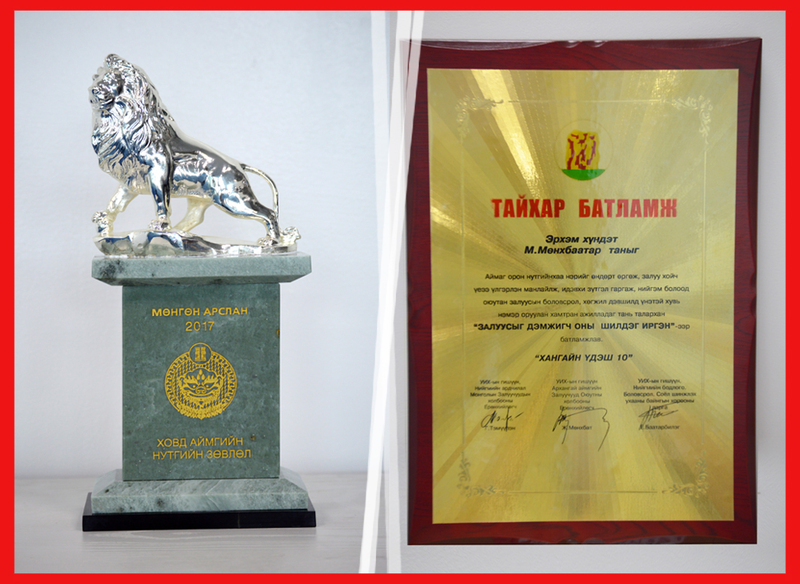 The award was given by Parliament members, Temuulen Ch, Munkhbat and Baatarbileg. As the shareholder of Erdenet Mining Corporation, MCC has been successfully implementing “Future of Erdenet-5 goals” events in Erdenet city as part of its social responsibility and good governance. We hope to continue our effective and successful cooperation in the future and show the best of our efforts in development and prosperity of the country!